For years, the end-user computing (EUC) community was divided into desktop virtualization (VDI) and enterprise mobility management (EMM). VMware has pioneered the “digital workspace” in order to address the ever-expanding EUC landscape – inclusive of modern apps, data, devices, identity, security, and work productivity. 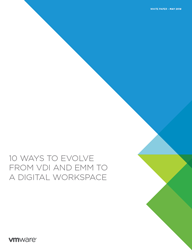 Brian Madden, Lead Technologist for EUC at VMware, explains how your enterprise can move beyond VDI and EMM towards a comprehensive digital workspace with VMware Workspace ONE™.